Whilst on holiday why not consider a day away from the beach or swimming pool and visit historic Gibraltar? It's just like a little bit of the UK in Spain (and hence in the sun!). As soon as you cross the border from Spain (don't forget your passport of you will not be allowed in) you'll see UK style Bobbies and British traffic lights! Whilst staying with us here on the Costa del Sol you will be ideally located to visit the famous "Rock" either by hiring a car or taking one of the many coach trips. Many people consider that Gibraltar, or "Gib" as it is often referred to, is one of the most fascinating places in Europe. Gib is basically a huge limestone rock (of 5.8 square miles), formed millions of years ago, which was pushed up by the earth's movement when Europe collided with Africa. It is also considered to be one of the original Pillars of Hercules - the other pillar is often thought of as Mount Acha in Ceuta, Africa. Often people think of Gibraltar as an island but it is actually joined to Spain by a narrow isthmus, or thin strip of land. The isthmus, after being widened, contains the runway for Gibraltar airport. It is much more sandy than the rest of the rock, as it remained covered by the sea for a much longer period. Gib towers over the "Straits of Gibraltar", which mark the separation point of the Atlantic Ocean and the Mediterranean Sea. Because of its location, it has historically been considered of significant military strategic importance. Since the Rock is made of limestone it is riddled with caves - these too have added to its importance. Many of the caves have been tunneled out or are man made and were used as battlements during many conflicts. As you walk around Gib you cannot but notice how it has been heavily influenced by the military. Gibraltar is also famous for its wildlife and the upper parts have been designated as a nature reserve. Plants peculiar to Gibraltar include wild olive trees and Europe's only native palm "the Dwarf Fan Palm". For those interested in plants there is an excellent Botanic Gardens, opened in 1816, containing some 600 species of trees, shrubs, cacti and flowering plants. Animals too thrive on the rock including the rare, Giant Oscillated lizard, the Swallowtail Butterfly and the native Gibraltar Partridge. Most famous of course are the Apes of Gibraltar, which are properly known as Barbary Macaques. These (somewhat) friendly creatures are almost tame and are a delight for young and old alike. 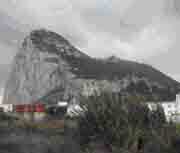 It is said that if the apes ever leave Gibraltar, then it will no longer belong to the United Kingdom. Another reason Gibraltar is a popular destination for people visiting is that its prices are Duty Free. Whilst this means that many goods are far cheaper than in Spain and in the UK (cigarettes at GBP 8.50* for 200 or GBP 8.00* for a bottle of Gin (*as at November 2006)) it does not mean you can take anything you like into the UK or across the border to Spain. Limits apply and they are far more rigidly adhered to than at other borders in Europe. If you are planning on visiting Gib on a Saturday, do be aware that many shops close at 2:00 pm. Many of Gibraltar's other attractions are a result of its long and mixed history. This was last rebuilt in 1333.
once a home to Franciscan Friars but since 1728, has been used as the official residence for Gibraltar's Governors. On weekdays the Changing of the Guard is performed at various times and is a spectacle well worth watching. Situated at Europa Point, overlooks the Straits and was once an ancient mosque. It was converted to a Catholic chapel in 1462 after the Spanish captured Gibraltar. Also at Europa point you'll find the only lighthouse outside of the UK that is regulated by Trinity House. Were first excavated by the British Army in 1779 and work continued until 1783. They form part of what is arguably one of the most impressive defence systems anywhere in the world. Which has graves dating back to the Battle of Trafalgar, is worth a visit as it is very cool in the summer and has a very restful ambience. Based in the coach park, is probably the best or most successful way to see the dolphins. Their cruiser, the "Brixharn Belle", can seats passengers in either sunshine or shade. It has a bar, toilets and a small souvenir shop. The cruise lasts for 90 minutes and has an award winning commentary on Dolphins and the history of Gibraltar. Dolphin World is recommended by many leading tour operators and was described by the BBC's Holiday Programme as "the highlight of the Costa de Sol" and by Sky Travel Channel as "The Ultimate Treat". Also consider taking the Cable Car to the top of the rock (where the monkeys are). You can stop at various points and walk down and take in the attractions as you descend. If you don't fancy the cable car, there are many taxis that will take you around the rock and stop off at various locations. There are so many things to do and see on the rock that it would be impossible to list them all here. If considering visiting Gib, do give it a full day and you won't be disappointed!